As a teenager, Danny Lawless was stricken by a love for modern poetry. After earning his master's degree in English and creative writing at the University of Louisville, he taught at other universities to include the Exeter College in England. He now teaches writing, film, and humanities at St. Petersburg College, Florida. His poems have been published in many well renowned publications and, in his free time, he finds time to run, play basketball, and travel. In a previous interview, you were asked what you thought was alluring about poetry and you said, “It is an art like any other.” What is a poem to you? A very good question and one that has been answered in about equal number to its referents it sometimes seems. So – a certain compactness, a palpable tension between and among “lines,” and economy of theme, one can go on and on. Take for example the prose poem: that debate had finally subsided – it was silly in the first place. But, as you also know, fierce at times in the past. I love that Robert Alexander’ Family Portrait was so successful in teasing out prose poems from writers not usually – if ever – thought of as writers of same -- from Paul Bowles to Gertrude Stein. Last – who really cares? Except publishers, perhaps – the purchasing public, maybe. When people submit to Plume, do they need to focus on the surrealist type of poetry since this is what you are drawn toward? No, they don’t. 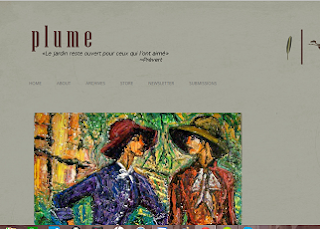 Plume began with the notion that it would be a journal of prose poems – its original name – in my mind – always was Canisy, after Follain’s marvelous book. Then with Plume, and the Michaux allusion, this continued. But, no, although surrealism is, I think, the defining artistic movement of the past century – maybe in all the arts – and we all owe its early creators a huge debt, it was not an explicit lens through which I would try to frame the journal – and many contributors, I would imagine, have little idea that this was ever my intention. The briefest glance at our journal will persuade you of the truth of this. What do you look for in a poem? In a previous interview, you said, “I’m not a fan of wasted words” and you are also “not a huge fan of nature poetry.” What should poets focus on when submitting? Or, does your tastes change based on the submissions, people submitting, or what poems you think people would want to read? Again, a good question. First, never the last: Plume is a solo effort, essentially, and money -- well, not much of a consideration – so I publish only what I like: if readers find something there, good! If not – maybe next time. Nature poetry (I seem to be answering you in reverse order) – simply not a personal interest: more of a Sartrean relationship to nature -- or Woody Allen’s): its huge indifference to me I return whole-heartedly. And sometimes it scares me. My early reading – that teen-ager! – of the surrealists had the effect of forming my taste for the direct, often non-narrative approach to poetry. Although I must say there are many, many exceptions to this “rule,” I generally shy from poems that seem willing to sacrifice any number of lines, or most of their presence, for a single remarkable image. The set-up, as it were, hasn’t much appeal for me; for example, what is Breton’s “Free Union” but a collection of great last lines/images? But, as I say this, I think of my affection for the early Bly, the Wrights, even Follain, and I know that this is only the vaguest feeling, much mitigated by my experience of other work since those days. In a previous interview, you said Plume was “pretty much a one-man show.” Is this still true? Alas, for better or worse, yes. Given the popularity of websites focusing on poetry, what do you think makes Plume stand out? I’ve thought about this – and honestly don’t know. The only thing I can say is that perhaps it lies in its format (for many, many journals showcase equal or better work, no doubt) twelve poems and a Featured Selection apparently is a digestible number, one arrived at through sheer luck as with most thing having to do with Plume. Also, there is the matter of, I guess, theme or preference – “eclectic” is the word most often used to describe our editorial policy – and that is being kind. As I say, I publish whatever I like, but I must like it a lot. In the beginning, you solicited submissions from other poetry journals. Do you still do that or do you rely on submissions or both? Do you invite poets to submit? Plume’s contents come now from solicitations, as well as work that comes in through Submittable. If I read the work of a poet new me, and I love it, I’ll send him or her an email saying so, and explaining briefly why, then propose that he or she might submit work to us. Often I get positive response (who knows why? ), sometimes not. Your magazine encourages international submissions. What do you find in international poems that appeals to you as an editor and reader? Well, not so many of the much-discussed “workshop” poems. Different themes, different concerns. I like the sense of urgency found there, often. I found this initially in the Eastern Europeans, for example, and no doubt there is the exotica of it, the travelogue aspect. But, finally, why not go to where good poetry is -- wherever that might be? I publish whatever I like, but I must like it a lot. So far, you have published three anthologies of poems. The first one drew mostly from the online work; however, the other two anthologies did not. How are poems for the anthologies selected? From Submittable and from poems poets have sent me, either in response to my queries or in the case of some regulars, they simply arrive in my inbox and if there are more than I can publish online, I reserve one or two for the print anthology. You regularly update the home page slideshow where writers can submit a quote, short poem, aphorism, snippet, or excerpt of 50 words or less. What are you specifically looking for in this submission? Actually, I don’t update the slideshow; it was an idea that fizzled and has been discontinued. But I must add I still tinker with the idea of re-launching it. In the recent monthly Featured Selection, you asked people to write about a job they held whether it was the first, last, best, worst, weirdest, or most illuminating. They were all very enlightening and interesting. Do you plan more of these inquiries into people’s daily lives? I do – and I am glad you found it interesting! It was, as you know, a by-product of a farewell to Phillip Levine – the mis-identified (in my and others’ opinion(s)). I think it’s fun to see what poets did before they became full-time poets – or teachers, as most of them are and must be. I’m kicking around the idea of a book of these, at the moment – with, say, 60 poets talking about their initial work experiences, accompanied here and there by poems and photographs, dismissal notices, etc. I, for one, at least, would but that book. Other such themes are possible too, right? First love, childhood catastrophes…the list would be very long. We’ll see. It seems alike a fair amount of work, and, at heart, I am a slacker of the first degree. Do you plan more events like last year’s collaborative poetry readings in St. Petersburg, FL? I do – we’ll have the annual Plume Poetry Series – we’ve been fortunate to have Billy Collins, Tess Gallagher/Lawrence Matsuda, and Richard Blanco so far, and I have an idea of who I’d like to come next, and next after that. And I think we’ll be doing smaller reading in Saint Petersburg, too. But the real thrust of Plume has been reading across the US – NYC, Boston, Chicago, New Orleans, LA, etc., and abroad – Paris, and I hope this year London and Amsterdam. What are you not reading and wished you were? I’m reading poetry every day, of course; just now Mark Irwin’s American Urn. Always I return to Cioran, Houellebecq, Thomas Bernhard, Nina Cassian, Trakl, Malcolm Lowry, Foucault, and Barthes. Sontag. Parra. Transtromer. Merton. So much to read – I wish I had time to re-read all of Proust, or read all of Knausgaard. What do you have planned in the near future for Plume that subscribers and submitters could look forward to seeing? I am thinking of a small publishing venture – Plume Books – but this is in the preliminary stages, and there are matters of finance to consider – and that amount of work again! I still teach (albeit online, which allows me to travel to attend to family matters and – make money), and I am writing quite a bit myself these days, so I am not sure I want to take this on – in an ideal world, yes – I have in mind some poets I’d love to publish, but ours is not an ideal world, far from it!